What do you do when the biggest threat to your project is your boss? It's not that your boss is out to get you. In fact, bosses generally mean well. 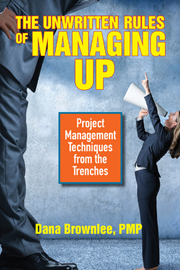 But clueless leadership from a well-intentioned boss can sometimes cause more damage than a criminal mastermind tying your project to the railroad tracks.The Unwritten Rules of Managing Up provides refreshingly practical and candid insight into the best practices and techniques that project managers have successfully used for decades to manage a wide variety of senior-level stakeholders—ranging from perfectly competent and pleasant to downright dysfunctional and inept.